This is a guest post from Igor Shevtsov, a MySQL DBA based in Twickenham, UK. Igor has had the opportunity to deploy and manage different types of high availability MySQL solutions, and we invited him to share his experience. Igor can be contacted by email or LinkedIn. Firstly I would like to say few words about our original MMM (Multi Master Management) MySQL setup and some reasons why we decided to start looking for another MySQL HA solution. We had 2 Data Centres with Active master1 in DC1 and passive master2 and Management node in DC2, both masters were running MariaDB 5.5 server. The clients were unevenly distributed across both DC's. DC's were connected by a VPN that wasn't 100% reliable and that occasionally failed. At this point, we have two masters having the same VIP. 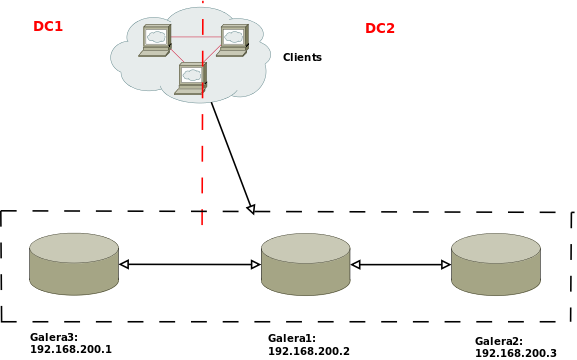 Each master is serving requests from clients that are in the same DC. 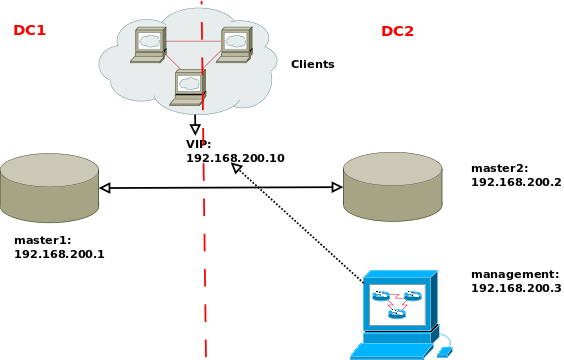 After the VPN was re-established, the management node brought Master1 back into configuration and set it up into a READ ONLY mode but failed to drop network interface with VIP. At this point, a number of clients returned and error “Failed to write to mysql read-only” and we were down at this point with an inconsistent database and a lot to think about. Thanks to Robert Hodges for very well explained behaviour of VIP. As you see the requirements are quite bold. After a bit of research we decided to move to a Galera Cluster solution as it looked like Galera ticked all the boxes plus it works with MariaDB which would simplify the migration process. At this point, we are ready to start the migration process. Here, we need to stop MMM management demon and MMM agents. # wsrep_cluster_address=gcomm://   # disable this for now!!! wsrep_provider_options="gcache.size=1G;gcs.fc_limit=256;evs.keepalive_period = PT1S; evs.inactive_check_period = PT3S; evs.suspect_timeout = PT10S; evs.inactive_timeout = PT30S; evs.install_timeout = PT30S"
Make sure rsync is installed and iptables open for ports 4567, 4568, 4444. At this point, all Clients are connected to Master1 and Master2/Galera1 is using asynchronous MySQL replication to replicate data from Master1. Install Galera Cluster with YUM. We use HAProxy Load Balancers running on a pair of nodes managed by Keepalived daemon. I will skip the instructions of installations of keepalived and HAProxy daemons. The main idea behind this setup is HAProxy is serving clients requests to the Galera cluster in load balancing leastconn mode. Keepalived daemon looks after availability of the HAProxy resource and takes care of failover in case the resource is unavailable. 4. 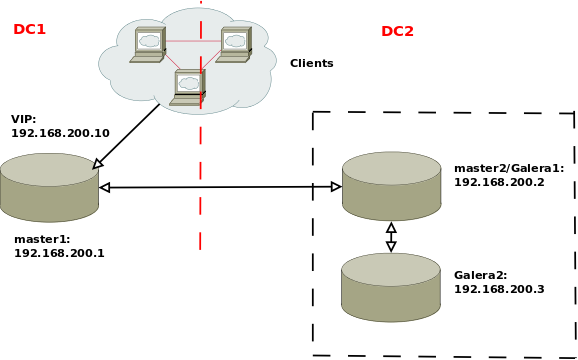 Direct the load to Galera through HAProxy. 1. Remove existent MariaDB server with YUM. 2. Install Galera server with YUM. 3. Edit /etc/my.cnf; remove MMM replication specific entries, add Galera entries. Migration done. Hopefully this post will help to migrate from MMM to Galera if somebody needs it. I have not covered load balancers and cluster management, but we use a pair of HAProxy instances mirroring each other in front of the Galera Cluster, and ClusterControl for monitoring and maintenance.